"What gear do you use?" "How do you practice with it?" "Why do you do certain things the way you do?" This New DVD is an attempt to answer these common questions and look at some of the larger concepts behind the Comtech Bowie Knife Method. To be clear, this is not an instructional tape in the sense of showing you "how to use a Bowie knife", so it is not for the uninitiated but the trained man. 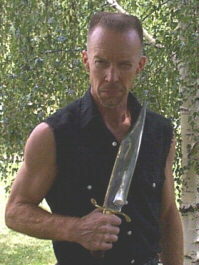 If you want to learn all the footwork, the evasions, the unseen angles of attack, the correct timing and so on that make the Comtech Bowie Knife Method unique then you need to study Mr. Keating's 6 part American Blade Craft series. If you call him to place your order you can get those from him also! Additionally, when it comes to technical Bowie study there is my own 4 part Bowie Combatives DVD series and Modern Knives DVD #5: The American Bowie where this material is all covered in detail! This new Comtech video is more of a thinking man's lecture with Mr. Keating which features active demonstrations of the various concepts. These are all things you should know if indeed you seek the art as Comtech shares it! From there it will be up to you to employ this information to advance yourself to the next level of skill with the Bowie, using this knowledge to help guide you on the correct path.